Once the drawing is completed, I cover it with a layer of Old Holland cremnitz white oil paint reduced with approximately 30% Liquin alkyd medium. This mixture should be thin enough to allow the under drawing to show through. 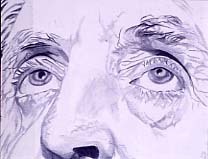 Before the paint dries, I use a number of different lead pencils to model and shade the image established by the underlying drawing. This dynamic process is critical to my painting technique because the lead of the pencils seems to liquefy as it combines with the white paint thereby providing the mid-tone values for the final painting. By the time the oil paint dries, the graphite image appears to be fused to the painting surface. The dried surface is often uneven because of the movement of the pencils through the oil paint making it difficult to adjust the drawing after the paint has dried. In a way it's like fresco painting only in black and white. I advise working in small sections because the process is more manageable.